These street signs mark an important crossing in the downtown area of Ottawa city in Ontario, Canada. Wellington is very well known as it is the street on which Parliament Hill and many government related buildings are located. 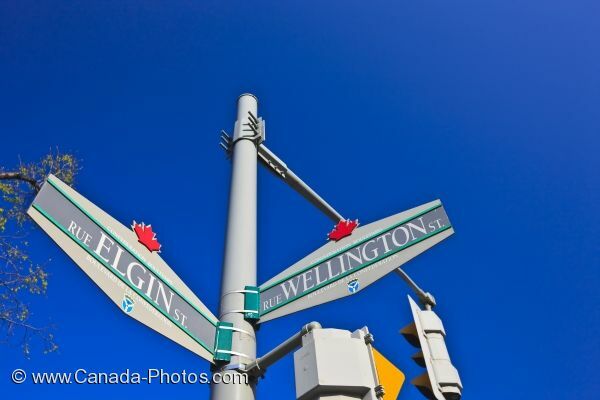 Elgin Street starts at Wellington and the first two blocks is made up of Confederation Square, a National War Memorial. Farther down are some other buildings which are home to the National Arts Centre, churches, court houses and City Hall. Picture of the street signs on a well known corner in Ottawa City in Ontario, Canada.